My tomatoes are bigger and better! Gracias Bombus atratus ! In many parts of the world tomato growers can no longer imagine a greenhouse without bumblebees: the benefits of bumblebee pollination in terms of yield and quality are just too important. 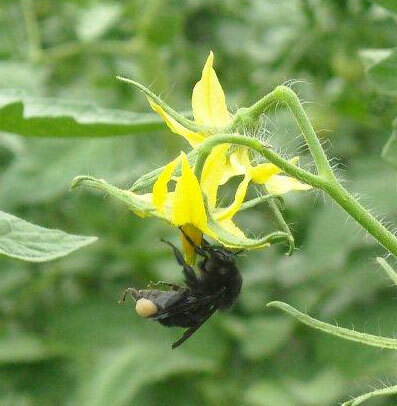 In Argentina, like in many other countries of Latin-America, growers of greenhouse tomato and other crops in need of pollination do not yet have access to commercial pollinators. This is now changing. Biobest Argentina, a Joint Venture between Biobest and Brometan, has started commercial production of a native bumblebee species. The product is being distributed by Brometan. Argentinian tomato growers are very enthusiastic. Mr. Alfay and Mr. Ritoza, both tomato growers in the La Plata region southeast of Buenos Aires, started a year ago with the use of commercial Bombus atratus. “I’m really pleased we started with bumblebee pollination, the results are much better than previous years. Better fruit set, larger fruits, more balanced clusters and all that with much less manual labour. Those are the advantages in a nutshell” says Mr. Alfay. “I can now spend more time on other tasks such as wirering and leaf pruning”. The grower also noticed that the bumblebees adapted quickly to all weather conditions and pollinated every flower as soon as it opened.